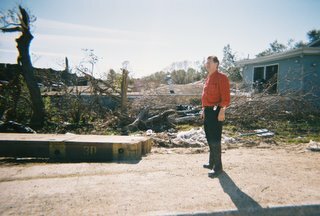 My wife and I spent a couple days after Christmas surveying the destruction in New Orleans. It broke her heart to see it. TV does not show you the real devastation - it reminded me of World War II scenes of destroyed cities. For blocks the homes are wrecked. Not a soul can be seen for miles. One or two diehards are trying, but they are doing it in toxic laden ghost suburbs like Chalmette. The photo was taken at the levee break in the Lakeview subdivision. On the left is where they are repairing one of the breaks. The houses are filled with mold. Now they stand like dry timber on soil contaminated by chemicals that poured in with the flood waters. At one levee I found out from the repair crew that there was not one break, but seven. Legislation authorizing levee upgrades have sat in Congress, ignored, for YEARS. Once again, the lack of foresight by our leadership has resulted in billions in losses. Had the levees not failed, New Orleans would not have flooded - it has lost 80% of its population. It will cost FEMA billions without addressing the levee problem. I saw little construction or clean up activity. You would think that our billions of tax payer dollars would result in a little more organized activity on the ground. Why does this concern District 22? Because DeLay was Majority Leader and could have acted on it before disaster struck. New Orleans is critical to America because it is the terminal for offshore oil from the Gulf of Mexico that drives America. It is a major coffee and sugar import port. The Mississippi River is our main north-south river of commerce moving grain from the Midwest. New Orleans is the southern terminal. If it didn't exist, we would have had to create it because of its strategic importance to our national economy. Keep in mind that Mr. DeLay has been sitting in office for over 20 years with the power to protect the Gulf Coast yet he failed to pass the necessary legislation. Texas, while hard hit by Rita, was spared a major hit to Galveston. Maybe next time we won't be so lucky. As long as DeLay is in power, we certainly won't be more prepared. I ordered a half Muffaleta at the Napoleon restaurant. The waiter returned and said they only had gumbo and one quarter Muffaleta left- supplies are still sporadic in the region. I took it and was grateful to have a taste of the city I love so much. News reports that Mr. DeLay filed by submitting “nearly 1000” signatures in lieu of paying the filing fee. Their spin: “"We wanted to show people the kind of support we have," DeLay said. I watched DeLay’s people hit on people for signatures at events all summer – and all they came up with is 1,000? In 2002, I filed 750 names for the GOP ballot – I started in mid-December and got them in two weeks! Then, to please DeLay, the party removed me from the 2002 GOP ballot, claiming I did not have the required 500. I had to stop campaigning and go to court to get back on. I spent the campaign season in limbo. We won the case and I was reinstated. By then the primary season was nearly over. So the 20% of the vote I got in 2002 was without benefit of campaigning or a mail out. As I watched DeLay’s people circulating the petition, I saw few people signing. When I was asking people for signatures, I was getting 9 signatures for every 10 requests. Even my volunteers were getting over 50%. If DeLay had the same success rate he would have turned in over 10,000 signatures not less than 1000! Bottom line: DeLay’s “strength” in the GOP is not as strong as the spin. On December 9, 2005, I filed for District 22's GOP primary to once again challenge Tom DeLay, who now is under indictment. There is talk of more charges coming out of a federal probe of Mr. Abramoff. Anything is possible. The US Supreme Court has decided to hear the Texas redistricting case. If it throws it out, this primary could be void and we could end up having to do this all over again in a special election. That means chaos on the GOP side. You could have DeLay convicted, a special election, and a dozen GOP candidates splitting up the vote versus one Democrat (Nick Lampson). 2006 promises to be a wild ride. My focus is on issues of concern to the people in District 22. It always has been. My prior campaigns made Mr. DeLay focus more on his district. I have seen three (3) different boundary configurations, and run in each. That could come in handy if we end up on a Special Election in a new district - where my 5 years of name recognition counts. We are calling this campaign "Operation Restore Honor." Why? It is evident that we need more, not less, ethics in Washington. We need a return to "Fjiscal Fjitness" to put it another way.